An action plan has been developed to improve car parking in Morpeth town centre. And the Northumberland County Council proposals include providing extra parking capacity through the re-development of the current Morpeth First School site once it is vacated – creating around an extra 150 spaces as a medium-term solution for the town. The strategies for market towns in the county follow parking studies and survey work, as well as seeking the views of local councillors and other key stakeholders. The county council has allocated £10million of capital within its Medium Term Financial Plan to fund parking improvements. Morpeth Town Council has now formally approved the plan for Morpeth. Work will be progressed to develop more spaces at Morpeth Railway Station on land next to the station building and investigate other options with Network Rail to increase capacity further. Coun Glen Sanderson, cabinet member for environment and local services, said: “We have been committed to finding workable solutions to the county’s parking issues that have the support of residents, businesses, shoppers and visitors. “While it’s clear that extra car parking is required in all four towns (Alnwick, Morpeth, Berwick and Hexham) to address the existing parking problems and plan ahead for anticipated future housing growth and demand, just building more spaces will not solve the parking problems. 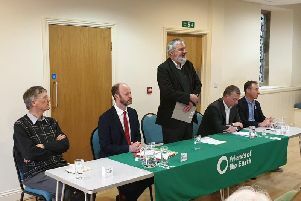 Other proposals include continuing discussions with Morrisons to make more efficient use of the spaces in the Staithes Lane car park, introducing shorter time limits of two hours in the Back Riggs and Corporation Yard car parks to increase turnover and bringing in a 24-hour maximum stay in long stay car parks. Morpeth North county and town councillor David Bawn said: “I welcome all the hard work that has gone into this study and the positive steps being proposed. Morpeth town councillor Nic Best added: “As has been indicated in the county council car parking review and successive annual town benchmarking studies, adequate and appropriate car parking is vital to maintain the vibrancy of Morpeth town centre.